This course enables students to further explore and develop technological knowledge and skills introduced in the elementary science and technology program. Students will be given the opportunity to design and create products and/or provide services related to the various technological areas or industries, working with a variety of tools, equipment, and software commonly used in industry. Students will develop an awareness of environmental and societal issues, and will begin to explore secondary and post secondary education and training pathways leading to careers in technology related fields. This course introduces students to communications technology from a media perspective. 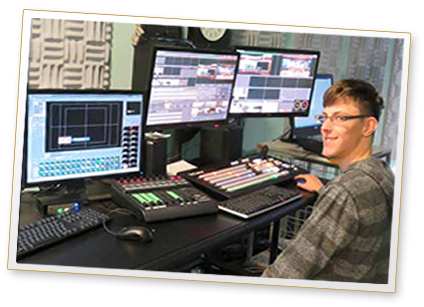 Students will work in the areas of TV/video and movie production, radio and audio production, print and graphic communications, photography, and animation. Student projects may include computer based activities such as creating videos, editing photos, working with audio, cartooning, developing animations, and designing web pages. Students will also develop an awareness of environmental and societal issues related to communications technology and explore secondary and post secondary education and training pathways and career opportunities in the various communications technology fields. This course examines communications technology from a media perspective. Students will develop knowledge and skills as they design and produce media projects in the areas of live, recorded, and graphic communications. These areas may include TV, video, and movie production; radio and audio production; print and graphic communications; photography; digital imaging; broadcast journalism; and interactive new media. Students will also develop an awareness of related environmental and societal issues and explore college and university programs and career opportunities in the various communications technology fields. This course enables students to further develop media knowledge and skills while designing and producing projects in the areas of live, recorded, and graphic communications. Students may work in the areas of TV, video, and movie production; radio and audio production; print and graphic communications; photography; digital imaging; broadcast journalism; and interactive new media. Students will also expand their awareness of environmental and societal issues related to communications technology and will investigate career opportunities and challenges in a rapidly changing technological environment. This course enables students to further develop media knowledge and skills with a strong emphasis on film production, while designing and producing projects in the areas of live, recorded, and graphic communications. Students may work in the areas of TV, video, and movie production; radio and audio production; print and graphic communications; photography; digital imaging; broadcast journalism; and interactive new media. Students will also expand their awareness of environmental and societal issues related to communications technology and will investigate career opportunities and challenges in a rapidly changing technological environment. This course introduces students to computer systems, networking, and interfacing, as well as electronics and robotics. Students will assemble, repair, and configure computers with various types of operating systems and application software. Students will build small electronic circuits and write computer programs to control simple peripheral devices or robots. Students will also develop an awareness of environmental and societal issues related to the use of computers, and learn about secondary and post secondary pathways to careers in computer technology. This course examines computer systems and control of external devices. Students will assemble computers and small networks by installing and configuring appropriate hardware and software. Students will develop knowledge and skills in electronics, robotics, programming, and networks, and will build systems that use computer programs and interfaces to control and/or respond to external devices. Students will develop an awareness of environmental and societal issues related to the use of computers, and will learn about college and university programs leading to careers in computer engineering. This course extends students’ understanding of computer systems and computer interfacing with external devices. Students will assemble computer systems by installing and configuring appropriate hardware and software, and will learn more about fundamental concepts of electronics, robotics, programming, and networks. Students will examine environmental and societal issues related to the use of computers, and explore post secondary pathways leading to careers in computer engineering and related fields. This course introduces students to building materials and processes through opportunities to design and build various construction projects. Students will learn to create and read working drawings; become familiar with common construction materials, components, and processes; and perform a variety of fabrication, assembly, and finishing operations. They will use a variety of hand and power tools and apply knowledge of imperial and metric systems of measurement, as appropriate. Students will develop an awareness of environmental and societal issues related to construction technology, and will explore secondary and post secondary pathways leading to careers in the industry. This course enables students to develop technical knowledge and skills related to carpentry, masonry, electrical systems, heating and cooling, and plumbing for residential construction. Students will gain hands on experience using a variety of materials, processes, tools, and equipment to design, lay out, and build projects. They will create and read technical drawings, learn construction terminology, interpret building codes and regulations, and apply mathematical skills as they develop construction projects. Students will also develop an awareness of environmental and societal issues related to construction technology, and explore post secondary and career opportunities in the field. This course enables students to develop knowledge and skills related to cabinet making and furniture making. Students will gain practical experience using a variety of the materials, tools, equipment, and joinery techniques associated with custom woodworking. Students will learn to create and interpret technical drawings and will plan, design, and fabricate projects. They will also develop an awareness of environmental and societal issues related to the woodworking industry, and explore apprenticeships, post-secondary training, and career opportunities in the field that may be pursued directly after graduation. This course enables students to further develop technical knowledge and skills related to residential construction and to explore light commercial construction. Students will continue to gain hands on experience using a variety of materials, processes, tools, and equipment; create and interpret construction drawings; and learn more about building design and project planning. They will expand their knowledge of terminology, codes and regulations, and health and safety standards related to residential and light commercial construction. Students will also expand their awareness of environmental and societal issues related to construction technology and explore entrepreneurship and career opportunities in the industry that may be pursued directly after graduation. This course enables students to further develop knowledge and skills related to the planning, design, and construction of cabinets and furniture for residential and/or commercial projects. Students will gain further experience in the safe use of common woodworking materials, tools, equipment, finishes, and hardware, and will learn about the entrepreneurial skills needed to establish and operate a custom woodworking business. Students will also expand their awareness of health and safety issues and environmental and societal issues related to woodworking, and will explore career opportunities that may be pursued directly after graduation. This course presents hairstyling, make up, and nail care techniques from a salon/spa perspective. Through a variety of school and community based activities, students learn fundamental skills in hairstyling, giving manicures and facials and providing hair/scalp analyses, and treatments. Students also consider related environmental and societal issues and explore secondary and post secondary pathways leading to careers in the field of hairstyling and aesthetics. This course has a strong emphasis on aesthetics, which enables students to develop knowledge and skills in cosmetology and offers a variety of applications that will equip students to provide services for a diverse clientele. Students identify trends in the hairstyling and aesthetics industry, learn about related health and safety laws, and expand their communication and interpersonal skills through interactions with peers and clients. Students consider environmental and societal issues related to the industry and acquire a more detailed knowledge of apprenticeships and direct entry work positions. Prerequisite: None, however TXJ201 strongly recommended. This course has a strong emphasis on aesthetics, which enables students to develop increased proficiency in a wide range of hairstyling and aesthetics services. Working in a salon/spa team environment, students strengthen their fundamental cosmetology skills and develop an understanding of common business practices and strategies in the salon/spa industry. Students expand their understanding of environmental and societal issues and their knowledge of post secondary destinations in the hairstyling and aesthetics industry. This course enables students to develop knowledge and skills through hands on, project based learning. Students will acquire design, fabrication, and problem solving skills while using tools and equipment such as lathes, mills, welders, computer aided machines, robots, and control systems. Students may have opportunities to obtain industry standard certification and training. Students will develop an awareness of environmental and societal issues related to manufacturing and will learn about pathways leading to careers in the industry. This course introduces students to the service and maintenance of vehicles, aircraft, and/or watercraft. Students will develop knowledge and skills related to the construction and operation of vehicle/craft systems and learn maintenance and repair techniques. Student projects may include the construction of a self propelled vehicle or craft, engine service, tire/wheel service, electrical/battery service, and proper body care. Students will develop an awareness of related environmental and societal issues and will explore secondary and post secondary pathways leading to careers in the transportation industry. This general interest course enables students to become familiar with the options and features of various vehicles, issues of registration, and the legal requirements affecting vehicle owners. Students will also learn about vehicle financing and insurance, vehicle maintenance, emergency procedures, and the responsibilities of being a vehicle owner. Students will develop an awareness of environmental and societal issues related to vehicle ownership and use, and will explore career opportunities in the transportation industry. This course enables students to develop technical knowledge and skills as they study, test, service, and repair engine, electrical, suspension, brake, and steering systems on vehicles, aircraft, and/or watercraft. Students will develop communication and teamwork skills through practical tasks, using a variety of tools and equipment. Students will develop an awareness of environmental and societal issues related to transportation and will learn about apprenticeship and college programs leading to careers in the transportation industry. This course introduces students to the servicing, repair, and maintenance of vehicles through practical applications. The course is appropriate for all students as a general interest course to prepare them for future vehicle operation, care, and maintenance or for entry into an apprenticeship in the motive power trades. Students will develop an awareness of environmental and societal issues related to transportation and will learn about careers in the transportation industry and the skills and training required for them. This course enables students to further develop technical knowledge and skills as they study, test, service, and repair engine management systems; power trains; steering/control, suspension, brake, and body systems on vehicles, aircraft, and/or watercraft; and/or small engine products. Students will refine communication and teamwork skills through practical tasks, using a variety of tools and equipment. Students will expand their awareness of environmental and societal issues related to transportation and their knowledge of apprenticeship and college programs leading to careers in the transportation industry.